Combine water and sugar in a pan and bring to simmer and mix until sugar dissolves. Add cranberries. Put into a container with a tight lid and refrigerate overnight. 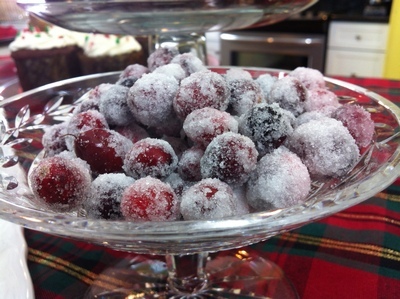 In the morning, drain the cranberries and roll them in sugar. Leave in the sugar in a single layer for about 3 hours to dry. Store in an airtight container for up to 3 days. If they get a little sticky, roll in more sugar and dry again at room temp.